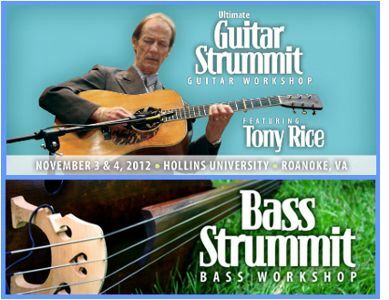 For the first time, the workshops will be located in the Holiday Inn Valley View in Roanoke, and we'll have some combined guitar/bass workshops, a special instructors show on Saturday night (exclusive to students only) and expert evaluation, set up, and instrument repair of your bass or guitar by Jerry Fretwell or John Miller. A special bonus, we'll also be doing a book signing of Still Inside: The Tony Rice Story during the weekend with Tim & Tony, only the second time this has EVER happened, fans of Rice and his music should not miss this. In past Guitar Strummits, the event has presented an open-to-the-public concert as part of the weekend's proceedings. This year they are doing something a bit different, with the Saturday Night Jam, which will feature music from all of their instructors in a private show for Students Only. So think of this, you're going to be able to attend essentially a "living room" style show with your instructors in a very intimate setting, up close and personal, and exclusive to you & your "significant other" for the evening. How's that for getting something that's available nowhere else? Don't wait, these classes are VERY limited in size and will fill quickly. For the first time, we will combine the Guitar students with our Bass students on Sunday along with our Bass Strummit instructors Mike Bub & Todd Phillips for a unique look at how these two instruments work together to guide & direct a band. Over the past 4 years, Strummit Works has attempted to create an in-depth workshop series in both bass and guitar, by employing some of the best players in the music world to teach our two-day sessions, and 2012 will be no exception. For the first time, they will also be combining the bass & guitar classes on Sunday's workshops to facilitate a better understanding of how instruments work together in a band setting. For a complete line-up of staff at the 2012 Ultimate Guitar Strummit, just click the link below to see who else you'll have the opportunity to learn from. For complete information or to register, visit either www.ultimateguitarstrummit.blogspot.com OR www.thebassstrummit.blogspot.com Room reservations, class reservations, schedules, and complete information are available from these sites.